Roll Ecru clay to about 1/4”thick. Tear the top layer of paper off of a scrap piece of corrugated cardboard – I purposely left some pieces for added texture. Place cardboard over rolled clay and press firmly to transfer texture to clay. 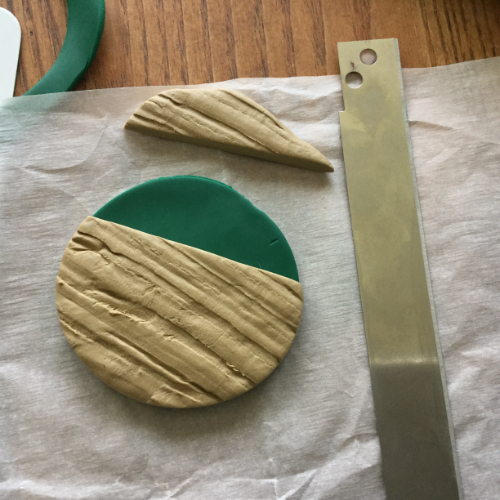 Use 60mm cutter to cut circle from textured clay. Roll Jungle green clay to a little less than 1/4” thick. Use 60mm round cutter to cut circle. Roll scraps from green clay again to about 1/4” thick. Sprinkle course salt over clay, press into clay to create texture. Use clay blade to cut the top off of the textured straw circle. Place onto green circle. 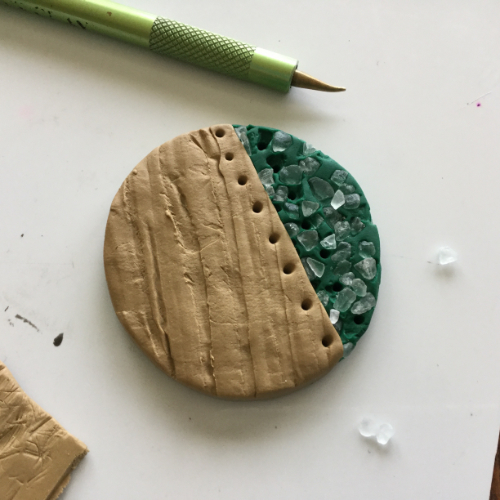 Use clay cutter to cut partial circle from salt textured clay. 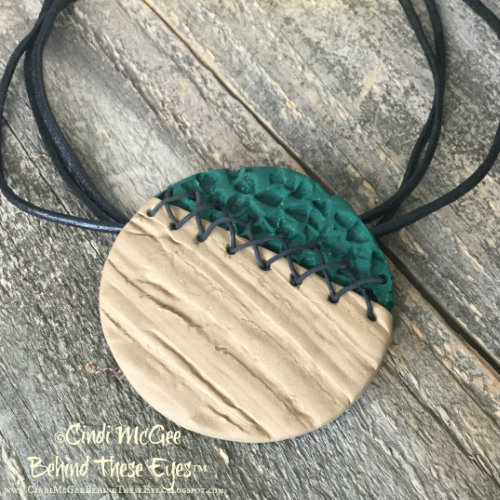 Using the discarded portion of the straw clay circle as a pattern, use the clay blade to trim to the same size piece from the green textured clay and place onto green backing circle adjacent to the straw clay. 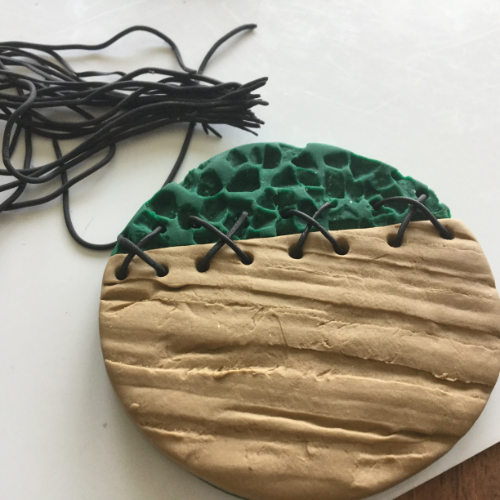 Use clay tool to create holes in top layers of clay as shown for for “stitching”. Bake according to manufacturer instructions. Let cool, then brush free the remaining course salt to reveal the imprinted texture. Roll remaining green clay and cut into a small rectangle, fold into a tube and mount to back of pendant for bail using a touch of Sculpey Bake & Bond. Bake again according to manufacturer instructions. Extrude black Makin’s Clay using a small multi-hole disc. Cut into small sections to create “stitching” – I added a touch of Beacon Tacky Glue to the ends of the small pieces before inserting them into the holes to create a criss-crossed stitching pattern. I used Makin’s Clay for the stitching because it remains flexible after drying and is less likely to break with normal wear. Let dry 24 hours. Add black cording and closure.